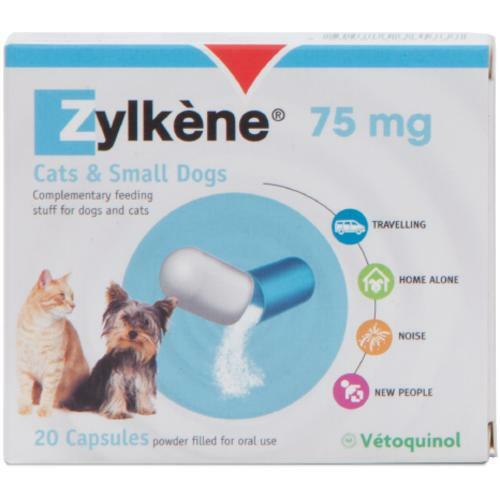 Zylkène contains a naturally derived product that can help your cat or dog to cope with stressful situations. Zylkène is an ideal way to help calm your furry friend during fireworks on bonfire night as well as to make house moves, stays in kennels or catteries, and trips to the groomers or vets less difficult, or help generally nervous pets. You don’t need a prescription for Zylkène as it is a complementary feed for cats and dogs and can be used for long or short term situations without causing drowsiness. Zylkène is very easy to give and because Zylkène is a product derived from milk, it's also very tasty and well accepted by both dogs and cats. Either feed the capsule the way you would normally feed tablets to your pet, or simply open it and sprinkle over their food.